The cruel terror troops known as Raptors consider themselves the elite of the Chaos Space Marines warbands. Their murder squads epitomise what has become of the Assault Marines of the Traitor Legions. 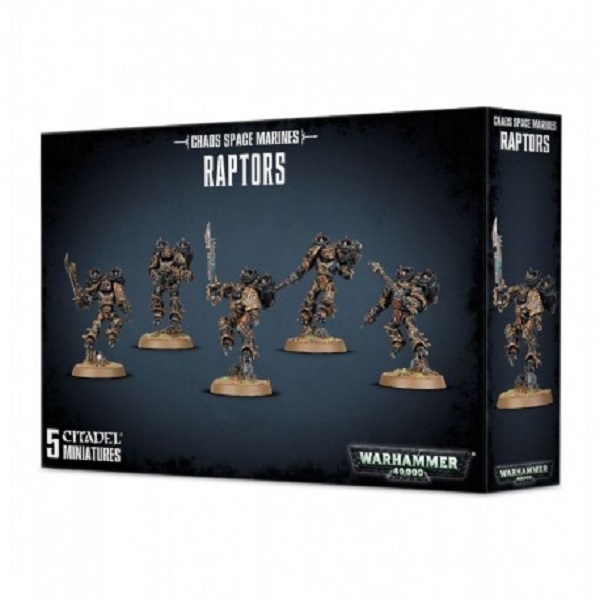 Chaos Space Marine Raptors miniatures come in a range of dynamic poses. They are sculpted perched or taking off from the battlefield debris on their bases. All over the models, their metal-rimmed armour shows all the distorting effects of the Warp: grills emerge from shoulder pads; cables jut from armour; teeth protrude from various surfaces around the rim of the jump packs. They carry bolt pistols and cruel chainswords. This multi-part plastic boxed set contains 116 components, five 32mm round bases, and a Chaos Space Marine Transfer Sheet, with which to build 5 Chaos Space Marines Raptors or 5 Chaos Space Marines Warp Talons.